It’s a lot to puzzle through: continuous buzz that Canada is in recession, a rate cut from the Bank of Canada, strong job creation and a hot housing market. Taking stock of the economic news that has come out of Canada over the past month has the power to confuse, certainly. Take a good look at the data, however, and you come out with a positive, not negative, outlook for Canada and our housing market. Let’s tackle the recession issue first. According to the gross domestic product (GDP) figures (the broadest measure of Canadian economic output), Canada has lost ground for five months in a row. If we make it six – or actually if we make it two quarters in a row, since Statistics Canada measures things on a quarterly basis as well as monthly – we’ve hit the technical definition of a ‘recession’, which is a contraction in gross domestic product for two quarters in a row. But have we really? 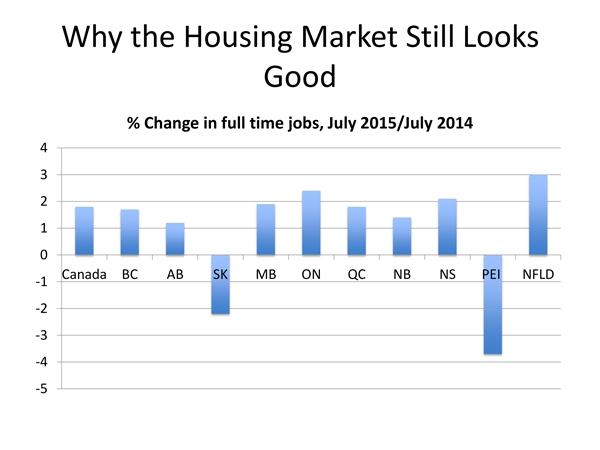 That Canada, as a whole, continues to do well is evident from the jobs picture. Overall employment was essentially flat in July (up 6,600 or 0.0 per cent) and the unemployment rate stayed at 6.8 per cent for the sixth month in a row. Still, compared to a year earlier Canada has added 161,000 jobs (a gain of 0.9 per cent) and the total number of hours worked has grown by 1.2 per cent. Things are even brighter in our most populous province. Employment in Ontario has increased by 67,000 over the past year (+1.0 per cent) and the unemployment rate has declined by 1.1 percentage points to 6.4 per cent – the lowest since September 2008. As a guide to the housing market, we like to look at what is going on in full-time jobs, and there the news is even better. Canada-wide, full-time jobs have risen by 1.8 per cent over the past year, and in Ontario they are up by 2.4 per cent. Even in Alberta, where the impact of lower oil prices has been felt most strongly, full-time jobs have risen by 1.2 per cent over the past year. Different cities and different sectors may tell other stories, but the big picture is clear: Canada is creating jobs, which is creating income, which is creating demand for housing, amongst other things. What we seem to be looking at is a Canada that has been boosted by interest rate cuts which are working the way that they are supposed to, by a low Canadian dollar, and by a decent expansion in the United States. As all of those elements continue to boost activity in the second half of the year, we see a nice offset from the impact of the sluggish energy sector. Often what is seen in a recession is a decline in jobs once GDP falls, followed by an increase in the unemployment rate. However, this time we have enough stimuli built into the system to provide some insurance against this happening. The Canadian economy is fundamentally strong, and Canadians seem to realize that.